2 What Is a Charter School? 4 Can College Students Borrow Enough? 5 Do Some Students Borrow Too Much? 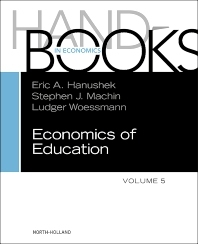 The volume of research into the economics of education has grown rapidly in recent years. In this comprehensive new Handbook, editors Eric Hanushek, Stephen Machin, and Ludger Woessmann assemble original contributions from leading researchers, addressing contemporary advances in the field. Each chapter illuminates major methodological and theoretical developments and directs the reader to productive new lines of research. As a result, these concise overviews of the existing literature offer an essential ‘jumpstart’ for both students and researchers alike. Eric Hanushek is the Paul and Jean Hanna Senior Fellow at the Hoover Institution of Stanford University. He is also chairman of the Executive Committee for the Texas Schools Project at the University of Texas at Dallas, a research associate of the National Bureau of Economic Research, and a member of the Koret Task Force on K–12 Education. He serves as a member of the Board of Directors of the National Board for Education Sciences and of the Governor's Advisory Committee on Education Excellence (California). Steve Machin's main research areas cover empirical work in labour economics, the economics of education and industrial relations. He is currently a Professor of Economics at University College London and Director of the Centre for the Economics of Education and Research Director at the Centre for Economic Performance. He is also one of the Editors of The Economic Journal. Ifo Institute for Economic Research, Germany.